You’ve got to urn it… | The International Cricket Hall of Fame. The real thing is kept locked away but the players love getting their hands on the trophy. The Ashes are elusive. The real urn, now almost 130 years old, stays in the Marylebone Cricket Club Museum at Lord’s. You can visit, but not touch, even if you are a winning captain. The contents and heritage of the terracotta urn, believed to have once been a perfume container, are elusive too. Legend has it that holds the ashes of a bail or stump. It was presented to England captain Ivo Bligh during the 1882-83 tour of Australia and, on his death in 1927, his wife presented the urn to the MCC. While she maintained that the urn contained the ashes of a lady’s veil, MCC officials say the contents are 95 per cent certain to be ashes of wood. 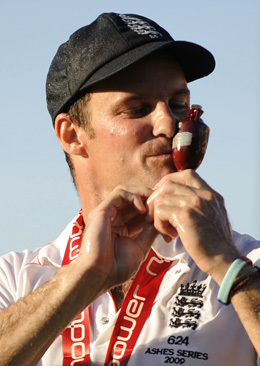 For the 1998-99 series in Australia, the MCC commissioned a Waterford Crystal vase to present to the teams. But the little replica trophies have proven far more popular. This article is courtesy of Inside Cricket magazine – get your copy today!